Every month, we get requests for things like lower airfares or reduced excess baggage rates. That’s why we’ve added these awesome amenities to our Gold Points program. In fact, becoming a member is the best way to receive discounts, gift certificates, airline miles and more! Read on for 10 ways you can turn your points into sweet rewards. Did you know? When you sign up as a new member, you’ll instantly receive 10 Gold Points. What’s more, every time you fly you’ll earn an additional 5 Gold Points. So after just one flight, you could redeem your 10 Gold Points for things like 10% off your next roundtrip airfare or an extra 50 pounds of excess baggage or freight FREE. Membership costs just $10 per person or each additional associate account. And points never expire! Save on excess baggage fees. Bering Air offers a generous 50 pound allowance for free, but sometimes, you need to bring more along. Accumulate gold points and earn an additional 50 or 100 pounds of excess baggage, free of charge. Bring a friend. Book your flight on Bering Air and get companion fare for $50. Share points. Transfer your Gold Points to another account member, family member or friend. Ship for less. Love outdoor recreation? Have your ATV or snowmobile shipped on Bering Air, or get reduced freight fees up to 250 pounds. Fuel up. You can redeem Gold Points towards having a 55 gallon drum of gasoline or heating fuel delivered to the village of your choice. Get cheaper flights. Fly somewhere for less or go somewhere a little further on vacation. 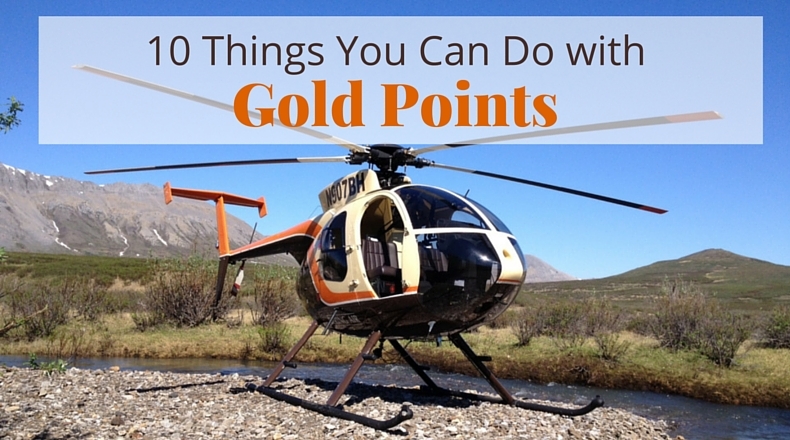 With Gold Points, you can receive 10-50% off your next roundtrip ticket. Get cash back. As you accrue points, you can earn between $100 and $400 in cash. Use it to plump up your savings account, towards for your next vacation, or to cover your next one way or roundtrip ticket via Bering Air. Go shopping. You can earn gift certificates valued at $100 to $200 towards merchants like Nome Outfitters, Wilderness Ski-doo and Morgan Snowmobile Sales. Try something new. You can also redeem your gift certificates at places like H2O Oasis Water Sports Park in Anchorage or the Aurora Inn in Nome. Travel outside Alaska on us. Save up your points towards a roundtrip flight in North America, Europe or anywhere else worldwide. You can also exchange them for miles on the airline of your choice. For a breakdown of how you can earn and redeem your Gold Points, check out the full program details here. How will YOU use your Gold Points? Tell us your plans in the comments!